Looking for an easy breakfast idea that's perfect for St. Patrick's Day? Look no further! Today I'm going to be sharing one of my favorite (and easiest) breakfast ideas. I absolutely love avocado toast and was all over that craze last year. I'm hoping that it's still going strong because I'm not getting over it any time soon! This version is more hearty and filling, but every bit as creamy and delicious. It may not be easy being green, but it sure is easy to make and devour this avocado egg salad! 1. Mash egg and avocado. I used an egg mashing tool, but you could also use a food processor or dice very fine. 2. In a bowl, mix mashed egg and avocado, mayonnaise, lemon juice, and seasonings. If you like the toppings more chunky, mix until all of the ingredients are just combined. If you like it more smooth, mix thoroughly. 3. Spread mixture over two slices of bread. Top with more pepper and paprika if you'd like! What are you doing for St Patrick's Day? Do you also love paprika? I have to say that it's one of my favorite seasonings! When I was in Hungary a few years ago, I picked up a few of the little pouches of paprika you see above. Our tour guide laughed at me and said one of those pouches wouldn't last a day in a Hungarian kitchen! What is your favorite avocado toast recipe? Yum! 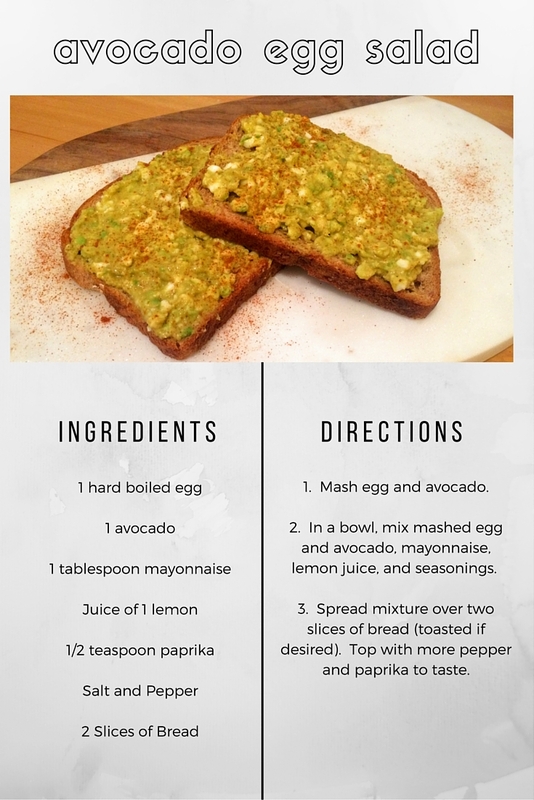 I loveeee avocado and this is the perfect sandwich/toast topper! I hope you'll try it out Kristy! not a fan of egg (i know, i'm weird), but I love everything else. this is a great way to mix up the usual egg salad. now i am craving avocado! I've made a similar avocado egg salad a few times, but always had it for dinner, not breakfast. But, I guess I've also been known to eat spaghetti & meatballs for breakfast, or a salad, so I don't think there's anything stopping me. PS. That little mixing animation is so neat! I'm sure this could be dinner too..I just don't like having bread at dinner for some reason! Oooh, look at you so fancy with that last image!! How cool! And I've never thought of pairing egg salad + avocado but the textures are so similar. It seems like a perfect match! Great idea and it looks delish! I'm trying! haha thanks Gina! Great idea! I made avocado egg salad all the time for Callum except I skip the mayo completely and just smash up tonnes of avocado. He looooves it. I'm obsessed with making breakfast toasted with scrambled egg and avocado but I love this idea for a super easy, protein packed lunch. YUM! Your version sounds great too Diana! This is such a good recipe and I want to make this for breakfast like asap haha. I love making avocado toast with a little garlic and sea salt! Girl you know how much I love egg and avocado! I'm going to need to try this the next time I whip up a batch of homemade mayo! Thanks for reminding me that tomorrow is St. Patty's day because I was just about to forget! Love avocado and egg... what a good combo! Yum I love avocado and egg together! I love paprika also and am impressed you could save those Hungarian pouches for so long - I go through even the normal stuff so quickly! Those packets I save for special occasions :) I also have a cheapo one from Trader Joes that I use more regularly! Love paprika! You know, growing up in Mexico, Avocado has always been one of my FAVORITE things to eat, we put it in sandwiches, tacos, eat it with rice, with soups, well, with everything! But the concept of avocado toast just baffles me. But I do love the idea of making it into an eggsalad...or a potato salad, or maybe on it's own, scooped out with a spoon... yeah... I'm hungry now! Thanks for the suggestion! Avocado is pretty much the king of all ingredients. It can be turned into anything! Magic. I've been making egg salad like crazy lately which is weird cus I never ever made it before. I never thought to put avocado in it! Give it a try next time you make some! mmmmmm all that avocado love!